Where is the shuttle pick-up location at SJC Airport? On-demand shuttles are accessible from Terminal A, Stop 2 and Terminal B, Stop 2. Pre-arranged San Jose Airport shuttles pick up passengers at Terminal A, Stop 3 and Terminal B, Stop 11. Click here to see a route map and find out where is the bus stop. Terminal A: Arrivals Curbside - Stop 1. Terminal B: Ground Transportation Island - Stops 8 and 9. Looking for a great San Jose Airport shuttle service that provides you with everything you need and offers great prices? If you are, then you’re in the right place. We work with leading shuttle operators such as Super Shuttle San Jose to bring you the best deals available and we pride ourselves on being able to meet our customers’ needs. Whether you would like a private van for your party or a shared ride to save on costs, we’ll be able to accommodate you. We offer both one way and return journeys as well as a range of pick up points, making our service really flexible and reliable. If you are looking for a great SJC shuttle service, why not reserve your journey through our website today? We’re certain that getting a shuttle to San Jose Airport will really help to take the stress out of your journey. 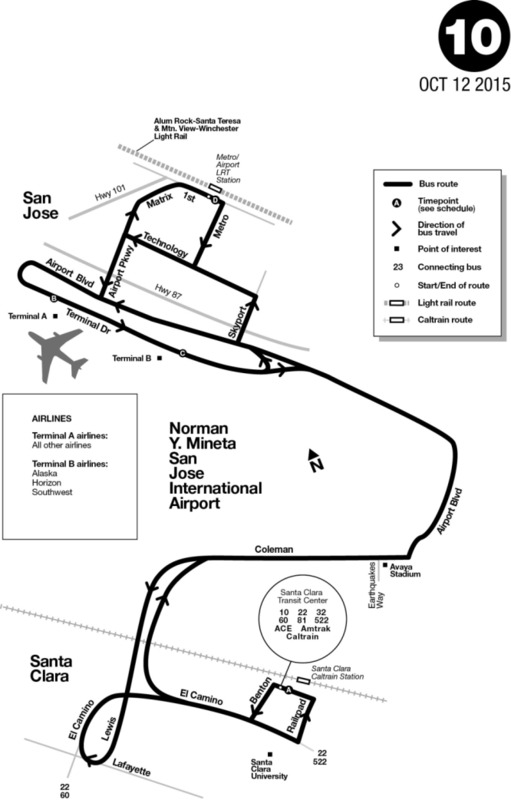 Norman Y. Mineta San Jose International Airport (SJC) is a city-owned public airport in San Jose, California. It is located three miles northwest of Downtown San Jose. SJC is named after San Jose native Norman Mineta, former Transportation and Commerce Secretary. If you’re looking for a ride to or from San Jose Airport, you’ll easily find whatever you need. There are numerous transportation options at SJC, such as San Jose Airport Shuttle, Rideshare, Taxi & Limo Service, Car Rental, Charter Buses, and Public Transportation. Looking for a safe and cheap ride to San Jose Airport? We will help you find the best deal. Check below to find out all the information you need about every transportation option. Airport shuttles are both cost-effective and convenient way to get to or from an airport. If you’re looking for a reliable San Jose Airport shuttle, we can help you. There are many shuttle companies in San Jose; we found the best ones, and you can discover their rates below. AAA Abe Express Shuttle is a great choice if you’re looking for both safe and cheap SJC shuttle. They are serving SJC, SFO, and OAK Airports. You can see their fares for other destinations here. Additionally, AAA Abe Express shuttle offers 10% discounts for students and seniors. For further information and booking, call them at 408-836-4302. Super Shuttle San Jose is the leader in airport transportation. This San Jose Airport shuttle provide shared rides, non-stop rides, business express, and black car services. You have to make a reservation in advance. Upon arrival, call 650-246-2740 and provide your confirmation number. You can then go to the “Prearranged Pickup” sign located on the curb (at Terminal A, Stop 3 and Terminal B, Stop 11). For additional information, call Super Shuttle phone number 800-258-3826. Delta Shuttle and Southwest Airporter have teamed up with Super Shuttle. ABC Airport Service is California shuttle serving SJC, SFO, and OAK Airports. They offer transportation services in the entire Bay Area and surrounding cities. ABC Shuttle can provide you with direct, door-to-door, and private rides at reasonable rates. You can book a ride via their website. Fill out the reservation form, and someone will contact you during the following 24 hours to give you a quote. Then, you have to confirm your ride, after which they will send the confirmation as well. Call this Bay Area airport shuttle at 800-840-0522 if you have any questions. ZACK's Airport Shuttle is another San Jose Airport shuttle that offers the friendliest service in the Bay Area. They are serving SJC, SFO, and OAK, offering 24 hours door-to-door shuttle. You can make a reservation online, or by calling Zack’s Shuttle at 408-483-6623. If you do it online, you have to book your ride at least 24 hours prior to your trip. They offer discounts for group rides, round trips, seniors, and students. If you’re staying at some San Jose hotel, there’s a chance you can get a free San Jose Airport shuttle ride. Many hotels require a call requesting transportation. So, call a hotel of your choice for any further questions. If you’re going to the airport, the driver will drop you off at the departures curbside of a terminal. Transportation Network Companies serving SJC Airport are Uber, Lyft, and Wingz. To help you compare the prices and find the cheapest ride, we’ve listed their estimates from SJC to Downtown San Jose. If you want to find a taxi cab at SJC Airport, just go to Terminal A, Stop 2 or Terminal B, Stop 1. Check the list below to find out all taxi companies available at the airport terminals. All of these companies are available on a prearranged basis as well. However, if you book a ride in advance, the driver will pick you up at Terminal A, Stop 3 or Terminal B, Stop 11. Looking for San Jose taxi rates? All trips from SJC are a minimum of $15, which includes the first 3 miles and a $1.50 airport fee. After 3 miles, the fares are charged at $3.00 per mile. Seniors and passengers with disabilities receive a 15% discount off the total fare. Rental car counters at SJC are in the Rental Car Center (RCC) which is located directly across from Terminal B. Passengers from Terminal B can walk across Airport Drive at the crosswalks from baggage claim to reach the RCC. Terminal A passengers may take any blue shuttle bus to or from the RCC. For a more luxurious and private ride, check our list below and find yourself the best limo service. Terminal A - In the second floor of the garage, north, and south of the terminal entrance. International Arrivals - Stop 3, on the south-east side of Lot 2. You don’t need to spend a lot of money for transportation from San Jose Airport. The cheapest choice is definitely public transport, and luckily, you will easily find a bus at SJC. VTA Airport Flyer (Route 10) offers free airport ride from Santa Clara Transit Center to Metro Airport LRT Station via San Jose Airport. To see a route map, click here. If you’re not sure where to find some ground transportation, see San Jose Airport map.